It seems that Apple has been busy lately with the software updates. They’ve released yet another update to another OS component before they release their newest OS, Snow Leopard. 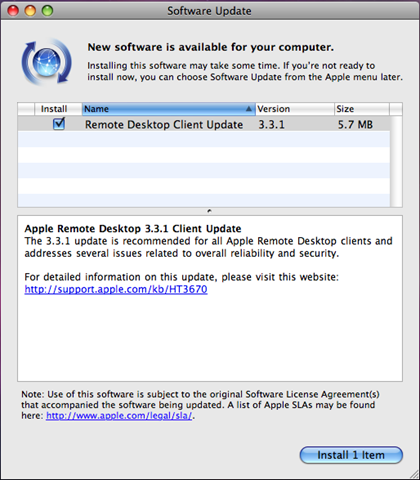 * Apple Remote Desktop Client 3.3.1 updates the software that facilitates Remote Management (enabled in Sharing preferences, in System Preferences). * Apple Remote Desktop Admin 3.3 updates the Remote Desktop application, which can be used to remotely administer Apple Remote Desktop clients. You can see the specifics of everything that these update packages contain here. The update is recommended for all Remote Desktop users.